exposure to and guidance from the natural world. Inner Wild is dedicated to helping individuals of any age cultivate deeper relationships to self, Earth, community and the numinous (mystery, wonder, imagination), through exposure to and guidance from the natural world. We serve both individuals and groups with a wide variety of programs, which range anywhere from half-day excursions to month-long adventures. 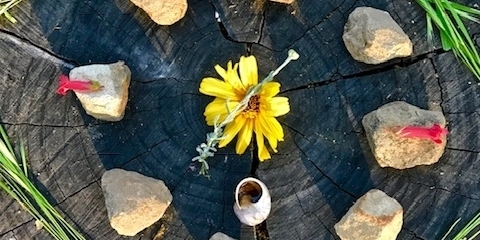 Our core framework is based on principles found in liberatory and community psychology, rites of passage, social and environmental justice work, depth and ecopsychology, human and systems development, narrative activism, deep ecology, contemplative practices, leadership development, mentorship and nature connection. Our mission: The healing, deepening and tending of relational wisdom. A five-week summer backpacking intensive on the Sacred Door Trail in southwestern, Montana. A program for adults, 22 and over, that explores the role that narratives play in shaping conceptions of self, society, and systems. What stories are we ready to let go? What stories are we ready to step into? Grief is a wound that when tended properly can also a guide. This intensive explores grief as a tool for individual and community healing and transformation. Guidance and mentorship programing for individuals and groups who either find themselves in or wish to create deep change in their lives.